One of my favorite pastimes is traveling around the country, looking for new and exciting places where I can play pinball during my travels. Recently, I found myself in Charlotte, North Carolina, and I noticed that the pinball scene is not as plentiful as it is in some areas of the country. That being said, there are some places that are definitely worth checking out if you are a pinball enthusiast. Let’s take a look. This is actually the first barcade in the city of Charlotte. It is an arcade that serves adult beverages such as craft beers, cocktails, and specialty sodas. When you enter the door, you will see more than 20 classic arcade games that include favorites like Ms. Pac Man, Donkey Kong, Mortal Kombat II, and Street Fighter III: Third Strike. There are also nearly 20 different pinball machines that you can enjoy playing. 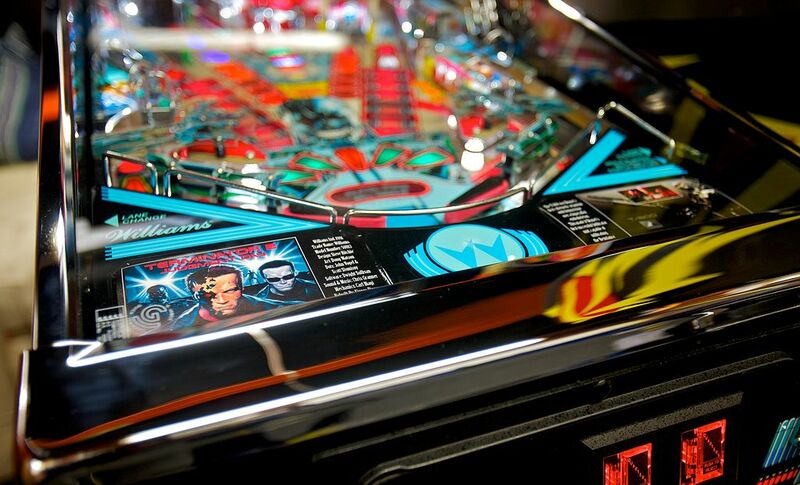 Some of the most notable machines that you will want to play while you are here are: The Indiana Jones Pinball Adventure, Metallica Pinball, Creatures from the Black Lagoon Pinball, and Addams Family Pinball. If you prefer console games, then you are in luck, Abari Game Bar also has an area inside the establishment that is designed so that you can veg out on the couch and play classic console games. They have games for the Nintendo Entertainment System (NES), the Super Nintendo Entertainment System (SNES), Nintendo 64, and Sega Genesis. Typically, this barcade is only open after 5 pm, but if you want to bring your kids, it is open to all ages on Saturdays and Sundays between 12 noon and 5 pm. Palmer St. is another great barcade that you will want to check out. This one is only open to adults over the age of 21, so you don’t need to worry about fighting over the games with kids. The barcade is open daily from 2 pm until 2 am, and on Fridays, Saturdays, and Sundays, it opens at noon to give you a little more game time. There is no cover to get into the barcade, but at any given point, there are at least 30 games available for you to enjoy. All of the classic games on the floor are set to free play, but if you are a pinball enthusiast like me, you are going to need to put in a few quarters. Each game of pinball costs 50 cents to play. There are some great games to play at this location like Tron, House of the Dead, and Mortal Kombat. The pinball machines that you should look for include: Star Wars and Back to the Future. They even have a Walking Dead pinball machine that you can try out. The management has decided to rotate the games on a weekly basis, but they promise to only remove one game at a time. When you visit Lucky’s Bar and Arcade, it is like stepping back into the 90s for the night. There is a game bar that has all of the classic console games from systems like the NES, the SNES, Nintendo 64, Sega Genesis, and even Xbox. While you play, you can nosh on the $2 tacos that are simply delicious and enjoy a nice cold beer. Insofar as pinball, there are quite a few machines that will catch your attention. Roller Coaster Pinball, Metallica Pinball, and Whirlwind Pinball are some of my favorites, but you can also enjoy exciting pinball options like Doctor Who and The Walking Dead if you prefer. If you feel like you have the skills to become the next pinball wizard, then keep an eye out for the tournaments that are held at this location every Wednesday night. This arcade also has plenty of cabinet classics that you can play as well like Tetris, Galaga, and Frogger. There are also other conventional games like Ice Ball and Air Hockey to enjoy. The final location that is worth checking out in Charlotte is an ice cream parlor that has a number of comics and gaming options that you can explore in the same location. There are classic pinball options for you to enjoy as well as newer games that you may want to try out. Some of my favorites at X-tra Ball are Star Wars and X-Men. They also have a Jurassic Park: The Lost World game that you can enjoy. They even have pinball tournaments at this location, so if you want to see some of the top pinball players compete, you can do so here. While you are enjoying your gaming session, there is a variety of hand-dipped ice cream that you can try. Charlotte, North Carolina is a place that has a very rich night life, but sometimes, you want to get away from the clubs and enjoy the night playing games with like-minded individuals. The next time that you are in this beautiful city, check out some of these great pinball arcades.